Thursday, January 31, 2013 :: Thank You! There are only 5 gift bags that I have prepared and it was such a hard decision to choose the 5 winners! :( I badly want everyone to be able to win something but it is not possible to send gifts to all! I am so sorry! If you see your email appearing in the photos below, it means you are one of the 5 lucky winners. * I will drop a few of my favourite hair products into your bag so you can have beautiful hair too! Audrey, I am glad you picked yourself up despite all the unfortunate things that have happened! I believe writing down the email for you was a form of release for you and you definitely felt a sense of relief being able to write it down in a positive manner to me :) I am genuinely happy for you that you managed to pick up the pieces and I hope the small gift bag will make your 2013 even better! :) Thank you for writing to me! Please email me back as I hope to meet up with every one of you and give you the gift bag personally. In the blink of an eye, it is now the start of 2013. So many things happened in 2012 that I find it hard to find a suitable word to describe its complexities. Let’s start from me wearing that graduation hat in Aug/Sept – officially graduated with a degree in Business Management majoring in Finance. It sounds really tough and truth is, it seemed to just pass me by breezily. But on second thoughts, there are months where I struggled through projects, working late into the night, forgoing my sleep just to complete project work and manage VGY at the same time. My friends know me as a self proclaimed “freelance” student because I am forever missing from classes – right from DAY 1 till the end of school. As you have guessed, not listening in on any of the classes made me struggle hard to study the entire damn textbook on my own just 2 weeks before exams. I am surprised I did not fail any modules given I have a terrible nickname “last minute queen”. It came to a point my classmates got so surprised with my grades despite the usual complaints and nervousness just before entering the exam hall swearing “I will fail this” that they called me bluff – I couldn’t find someone to confide in my nervousness and fear before the exam. But then again, I am thankful I have the couple few friends whom helped me out with revisions just before the exam to name a few, Ryan, Jun Xian, Elvin, Idah, Sharifah. Yes, they are the same people who called me bluff haha. I am pretty anti-social in school and I stuck with these few friends from year 1 till the end. To the rest, I am sorry if we had been in the same class but I have never spoken to you – definitely not an ice queen but I am really shy, geez. Getting the graduation hat was a milestone because I paid for my own studies which amounted to $30++k. On top of that, managing constant stress of having a $100k debt which I have to repay after my graduation – that I don’t wish to go into details again. If you had been a loyal reader, you would know what happened. Business is always risky and to lose $100k in the course of it is a hard hard real life lesson learnt. But this lesson put my ethics to test and I am glad and almost too proud to proclaim I am an individual with high ethics. Closure came in the form of the culprit involved heading to jail last October 2012. I am counting down the days to his release next year before I start my paint-pouring activities again. No, I was just kidding. But, I do have my ways to make sure he is alive to repay every single cent haha. From this incident, the phrase “desperate times call for desperate measures” became a whole new meaning to me. On VGY, it had been my proudest achievement to date next to holding a degree. VGY definitely had her share of ups and downs. I have experienced the wave of online shopping trend and also witnessed how consumer spending have changed over the course of 4 years (VGY started in 2008). The business is definitely much more competitive now and to keep up with trends, expectations, management of inventory flow, photoshoots amongst many more are extremely stressful. Ironically, I came to a point where I envied people on a paycheck because it is more of a routine way of working than having to manage a business on your own. This year upon graduation, the meaning of managing VGY came to a new high when I focused my efforts on sourcing designs, meeting suppliers to come up with more manufactured designs. It was also VGY’s 4th birthday on this collection and I managed to rope in Maybelline and Vanity Trove for a collaboration! It was not easy to get past self doubts on getting big brands to work with VGY when blogshops have became so common nowadays. Everyone have times when they doubt themselves much less me – I am only a human being. I was elated when Maybelline gave the nod to work together (they offered goodie bags in higher retail values to VGY than those given out to other blogshops and gave me exclusivity in launching their products first). And of course many props to Vanity Trove who have provided 5 troves with wonderful products just for VGY customers :*) This 100th collection was such a milestone for me and perhaps one of the most meaningful things that happened in 2012. Then came the extremely popular Amelia Peplum Skirts which sold like hotcakes. I wanted more florals so I decided to manufacture a huge bunch of floral designs. I cannot stress how much I love this pair of shorts. I kept 3pcs each of my size in XS in both colors haha. 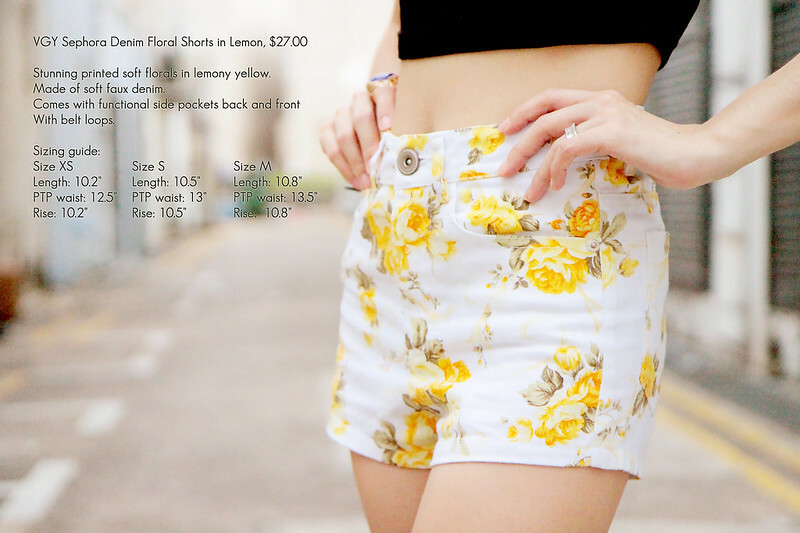 I love wearing shorts especially when they are in florals! Anyone wants this in a new print for 2013? Hee. Also manufactured my own tiffany green colored blazer. I have always wanted to own a blazer in that gorgeous color so I thought why not do it myself? Many customers have concerns over sizing matters in VGY as many have known me to be extremely petite. It is actually a matter of perception. The sizing of M & L sizes are not enough to change the perception of many customers and potential ones at VGY as it is hard to imagine the clothes in bigger sizes when it looks perfectly snug on me. Therefore came the decision to find a model of ideal proportions – and Kennie fitted the bill. One of my favourite dresses this year worn by Kennie below. So the remaining fabric was used to make this cute preppy floral dress! Somewhere in late October, I developed a sudden obsession in white boyfriend shirts. But I don’t like how John’s white shirt (1) is always too big on me (2) does not have a flattering waist cut (3) looks extremely boring. So I decided to make my own and add a twist with peeking lace. I chose a fabric thick enough for presentable corporate image but yet thick enough to wear on its own…without any lingerie underneath ;) haha now you know – that’s the whole point. I got bored with the usual peplum tops. 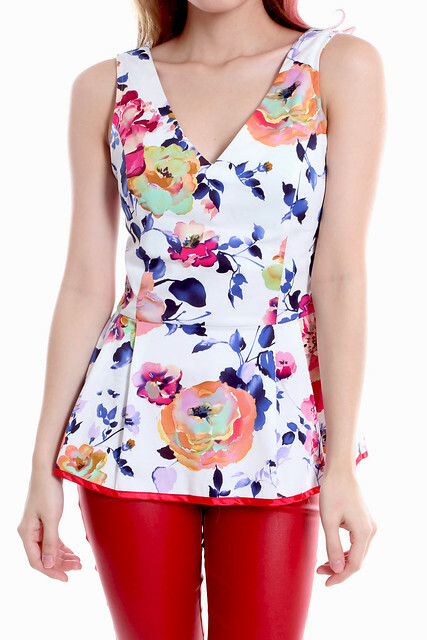 So I added in satin trimmings at the hems and manufactured a structured look peplum top in white and florals. For the year end, my mood board was full of romantic laces and so I translated that into manufacturing exquisite lace dresses. And I decided to dabble in manufacturing rompers since they are my favourite next to maxis. The response was extremely quick and overwhelming that it caught me by surprise! Thank you for supporting VGY's first manufactured romper! The last collection in 2013 features mostly self manufactured items which was quite a mad rush for the manufacturing end to fly the stocks back to sg! I have always loved body hugging dresses but trust me, nothing fits me snugly from H&M, Topshop, Dorothy Perkins, Miss Selfridge, Forever 21 etc. It will always be a tad too big for me. So I decided to make my own year end body hugging party dress from XS all the way to L size. Haha, talk about revenge on these big brands. The cutting of this dress is extremely flattering and I worn it out so many times – for Salon Vim’s Bugis outlet opening, for my birthday, for year end, for weekend date nights with John. Last of all, I have always wanted a body hugging shift dress that will make me look like a power career woman at her best. And since it is the year end, I decided to make this dress in a kickass glittery fabric. It took some time to find the perfect fabric but it was worth it! Speaking about career woman, you must be wondering why would I need dresses like that when I do not have to adhere to any office attire ;) It is because……………………………….. I have made some plans for 2013. I talked to a few close friends about it and it has spurred my determination to “find a way out”. Yes, it is to find my way out to a better future – to better utilize my time, to widen my social network, to expand my knowledge and to be in tune with the market trend. I will only let you know what it is once I successfully turn this into reality :) My plan for 2013 is pretty solid and I hold good faith that I’ll see to a route of success or even better than that, “a way out”. John is extremely supportive about it (that’s all I need) and I believe with his encouragement and optimism, 2013 will be a great year for me! On my relationship with John, 2012 marks a new chapter for us as we became more sure of our love for each other and the promise to walk the future together. We do have our ups and downs which you really don’t wish to know haha (like the one I smashed his windscreen). Like all couples, we quarrel, we scream and we get fuming crazy mad with one another. In fact, the last few days of 2012 was living hell for us no thanks to some brazen individual – some people just cross that line knowingly. I know I said this post will be honest to the bone but some things are too much for me to reveal. However, I have learnt to take things in my stride :) I AM in fact thankful that last few days of 2012 WAS a living hell because our love has grown even stronger. I am writing this down at the expense of being completely transparent about our lives as I know alot of couples around me are undergoing difficult times. I just want to say never give up on your relationship as tribulations come at the disguise of “difficult times” to teach you how to love a person and how to maintain a relationship. Get past it and you will find yourself falling in love all over again. Felicia – Thank you for always listening to me. I know I talked alot when I see you because I really can’t stop blabbering. I have so many words penned up inside me (that gets stored up for….months on end) because you know I talk to no one else except you so thank you for listening to me. Thank you for always standing on my side and being there. It is so easy to talk to you and cry because it is so easy to let go in front of you. Sorry I had said mean stuff in a fit of my horrible anger temper but you know I don’t mean it! Thank you for being my one and only best friend! :*) I am always so happy to see you! I am glad we have studied together, danced together, loved together and graduate together in year 2012! We are the living testament that best friends do everything together even when they are not by each other’s side! To my readers – Thank you for being so supportive although I do not blog often. I am amazed many of you still come back to read haha. During one of the blogging saga in 2012, many came to my rescue and even took time to email me with kind words. To those whom have touched my heart, thank you :*) I have something special for you at the end of this post! Of course there are many many others I am thankful for like my suppliers who have been helping me with VGY manufactured stocks, customers who leave me constructive feedback (sorry I can’t reply to all but I do read every single one of them and it all gets me thinking all the time! ), kind souls who drop me encouraging messages (to name one, Daphne deaf.knee), Melvin from Multifolds Photography whose timely appearance brings VGY photography to a whole new level, Kennie who came onboard VGY as our model was amongst many others who have touched my life in a way or so in 2012. The beautiful Gushcloud bloggers whom I have became friends with :) Everyone is extremely friendly, funny and fun to be with! The mad bunch. Seriously I don’t know what to say of us. Just thinking of us together makes me laugh out loud haha. The precious Heroine Make girls whom I feel so happy to see everytime! Johnny Walker Circuit Lounge party night was a night to remember! Lastly, I know this comes abit too late but better late than never! I have prepared 5 bags of presents for my readers! The bags will contain makeup goodies from various brands, skincare products, hair care products and some of my special cult makeup products! To name a few brands, Penhaligon, Loreal, Maybelline, Heroine Make, MAC, SAEM, Laline etc) The items inside each bag is different! I hope you will like what I have prepared! It is a small gesture compared to your support all these years! Monday, January 7, 2013 :: L’oreal Paris Excellence - My New Color! I have wanted to give my hair a brand new color to celebrate the end of 2012 but John’s appointment is horribly packed that he couldn’t find an empty slot to do my hair before 31 Dec. When there was finally a slot, it will be at a last minute notice due to cancellation and I was unable to head down immediately. Therefore I jumped at the chance to try out this new Loreal Excellence range which promises high shine and vibrancy to your hair. I chose p56 for the most intense violet red ;) I never had super red hair before so I thought why not do something wild and fun before 2012 is over! What you can find in a pack. On a side note, my hair appeared to be in slight curls as I have bun it up prior to taking photos. I first applied the protective pre-color serum on my hair to protect my hair. Upon coloring, I also used the range of products from Loreal Paris’s Color Care System which nourishes my hair and gives a touch of radiance. I use my masque 2-3 times a week to moisturize my hair as I stress my hair pretty often by blow drying, curling and drown them in hairspray whatnots. The result of a 15-minute DIY hair color job done in the comfort of your home! This is my hair in its natural state without curling nor straightening. John even asked me why have I become so lazy and not curling or blow drying my hair which is very unlike me. The color red actually brightens up my face and make me look even fairer. I feel like a princess with red hair, haha! Contrary to dryness after a DIY hair job, you can see the color is extremely vibrant and my hair shines. Went out the next day with my new hair on the last Sunday of 2012 for VainGloriousYou’s year end appreciation lunch at Royal China. Stay tuned and I hope the first week of the new year has been going well for you so far! Remember to pamper yourself because you deserve it! If you really like my hair and am wondering where to get this hair dye, the L’Oreal Paris Excellence & L’Oreal Paris Hair Expertise EverPure Range are available at all Watsons, Guardian, Supermarkets as well as at Departmental stores! Excellence Fashion is at a special introductory price of $15.90 (U.P. $18.90) for the month of January! When you are happy with yourself, you radiate with happiness and then you can start helping people selflessly from there. The rule I live by daily – be good to yourself and everything else will fall into place nicely after that.